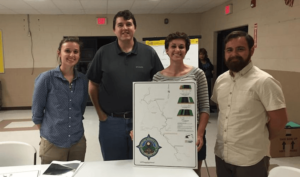 Rail-Trail Idea Builds Momentum in Wyoming County – Planning Team Members Needed! Raising support for big ideas in Wyoming County. Innovation Acceleration Strategy (IAS) sector teams are flourishing in Alderson, Lincoln County, Madison, McDowell County, and Wyoming County as we all prepare for the IAS Regional Development Workshop on December 1. The Wyoming Transportation team formed quickly at the first IAS meeting. Local resident Matthew Allen has great plans for an abandoned rail line throughout the county just waiting to be capitalized on for economic and community development, by converting it into a rail-trail. With an engineering background, Matthew started mapping the routes right away and researched possible partners and grant funding opportunities. I joined his team because I saw this as a great opportunity for the West Virginia Physical Activity Network to offer resources and add capacity to his project. The rail-trail idea has great promise in Wyoming County by bringing in visitors to explore what could hopefully be a part of the National Coal Heritage Area, but also would help improve the health of residents of Wyoming County. They would be able to take advantage of safe routes to school and work via the rail-trail, and increase their leisure time physical activity because they would have a safe place to run, walk, bike, and roller-skate. Are you interested in recreation or tourism? Are you interested in improving the health of the residents in Wyoming County? Are you interested in improving economic and community development in Wyoming County? If so, we would love for you to join the team studying the rail-trail project and other transportation initiatives in Wyoming County. “We are focusing on a pedestrian trail that will highlight who we were, who we are, and who we want to be,” says Matthew, the group’s fearless leader. In conjunction with pushing for a rail-trail and water trail development, the team has also formed a ‘Guyandotte River Triathlon Subcommittee’ because we recognize that community buy-in will be crucial in the beginning stages of development of these bigger, longer term projects. The rail-trail idea has great promise in Wyoming County by bringing in visitors to explore what could hopefully be a part of the National Coal Heritage Area. If you would like any more information we’d love to talk to you! You can email Matthew Allen at allen@andassoc.com or call me at 606-344-2038. We hope you will join us for our next meeting at 5 p.m. on Nov. 3 at the Wyoming County branch of Southern Community and Technical College, 128 College Drive Saulsville. View full story PDF here.